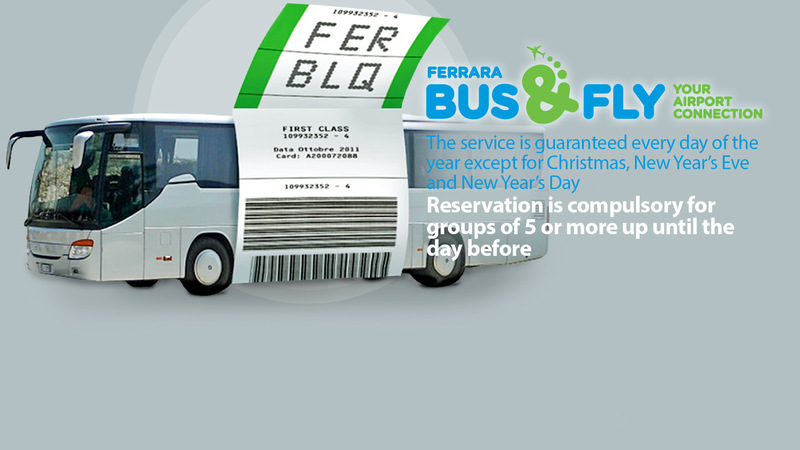 In these Conditions of Carriage the following terms shall bear the following meanings: The Company: "Ferrara al Volo" network and its associates are the carrier who provides the vehicles and the transport service. 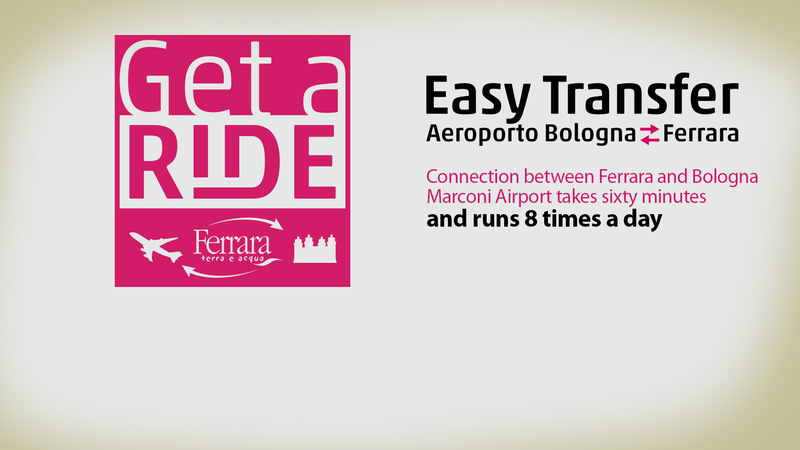 The Passenger: any person being carried by or about to be carried by the "Ferrara al volo" network. 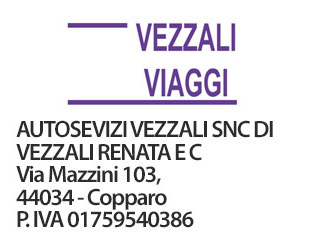 Shuttle: any vehicle used by "Ferrara al Volo network" to cover the route between Ferrara-Bologna's airport and Bologna's airport- Ferrara. Shuttles will pick up and set down passengers at marked bus stops only. Passengers are not allowed to get on and off until the vehicle has stopped completely. In case of request stops, passengers who wish to board a Shuttle should report to the designated Shuttle Stop and give a clear signal in good time to the driver of an approaching Shuttle. Passengers are expected to notify their intention to get off at a specific stop in advance. For boarding passengers, the service might occasionally be unavailable as a result of the vehicle being fully loaded, which means that passengers might not be allowed to get on the Shuttle if the maximum number of passengers permitted to the vehicle has been reached. Whenever they board a Shuttle, passengers must either possess a regular ticket purchased at the official ticket agencies or they must immediately buy it from the staff onboard. They should retain their ticket unaltered and legible for their entire journey for inspection by a Company Official. Tickets are also valid as bills for tax purposes. Validated tickets are non-transferable. Tickets, either validated or not, are not refundable. Should the service be interrupted and/or should it be impossible to respect the scheduled time because of circumstances beyond our control, no ticket refund will be made. The Company guarantees the destination will be reached anyway. 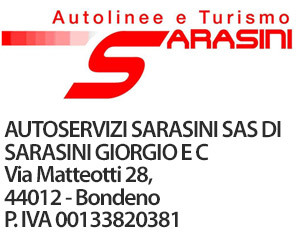 All passengers must comply with the Italian laws and regulations, namely the Art.172 C.d.S. (modified by D.Lgs. N° 150 dated 03/13/06 implementing the EU decree 2003/20/CE) relevant to the use of the safety belts and other safety restraints, especially for children, whilst the vehicle is in motion. Consequently, all passengers must wear the seatbelts when installed on the seat (all vehicles registered before 2000 are not submitted to seatbelts obligation, so they may not have seatbelts installed) according with the signs onboard or following the staff instructions. Should passengers not comply with the above mentioned rules, they are liable to prosecution. If the passenger is under age, the adult who is travelling with him/her is liable of prosecution. All children under 1 metre of height accompanied by an adult may travel free at any time. Passengers can bring a dog or any other inoffensive small animal onto the Shuttle, provided the animal is kept under control. Any such animal carried on the Shuttle must either be on a lead and muzzled or be carried in a suitable container. Animals must not be put on a seat. If a passenger brings an animal onto the Shuttle, he/she will be held responsible for any damage, loss or injury arising from the animal's presence on the Shuttle. A ticket must be purchased for each animal according to the ordinary fare for the journey it takes. Guide dogs or hearing dogs accompanying disabled persons are carried without charge, with no obligation to muzzle or cage the animals, provided they are not a danger or a nuisance for other passengers. The driver or the staff may refuse permission for passengers to take an animal on the vehicle if the above mentioned conditions are not met or in case of space constraints. Each passenger may carry one item of baggage plus one piece of hand baggage and one pram or buggy for free (included in the ticket fare). Passengers will be required to pay a charge corresponding to an ordinary ticket for extra or oversize baggage, sports equipment (for instance bicycles) or big musical instruments. Any kind of luggage which, because of its size, cannot be stowed in the overhead rack or under the passenger's seat, must be stowed in the luggage boot. Passengers remain responsible for any item they bring. This is why the Company advises not to carry fragile objects or items such as cameras, laptops, money and other valuables in the luggage which is stowed in the boot. The Company cannot be held responsible for any loss or damage unless it concerns the luggage for which the passengers have paid a specific fare. In this case the Art. 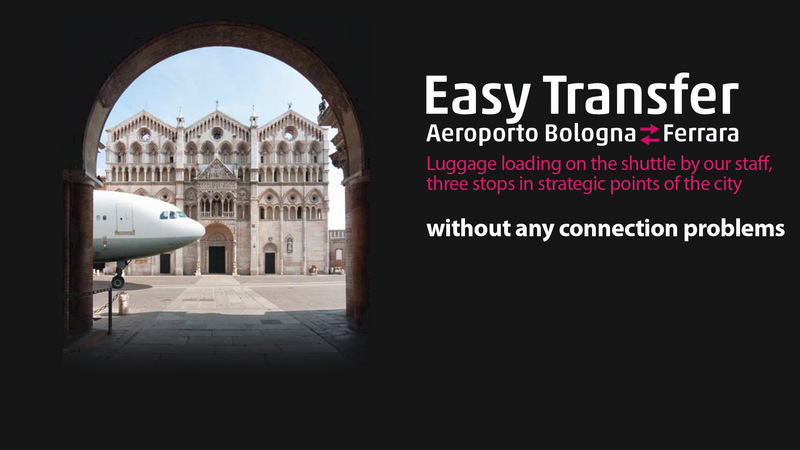 2 Legge 22/8/85 n. 450 of the Italian law, stating the maximum refund can be Euros 6.25 per Kg up to the amount of Euros 103.29 per item of luggage, is applicable. The loss or damage must be declared at the moment of the luggage recollection and a copy of the carriage document must be enclosed to the statement of loss/damage. Certain items cannot be carried under any circumstances in the interest of safety. These include dangerous goods, noxious and inflammable goods, firearms and similar. is noisy, offensive, violent or is disturbing the public peace. 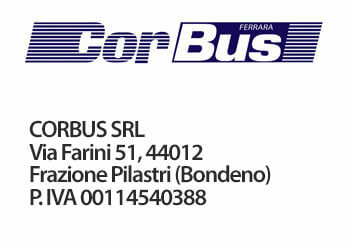 For the passengers' own safety, for the safety of all the people travelling on the vehicle and for the sake of the service regularity passengers are required to follow the instructions given by the Company's staff at any time. The Company cannot be held responsible for any injury or inconvenience to passengers if they refused to travel under these circumstances. The published running times for any individual service may be changed at any time within the period of validity. Any variation will be notified on the Company's Internet site and issuing warning notices which will be placed at the Shuttle Stops. Sometimes the published running times can be affected by events beyond the Company's control such as road works, traffic incidents, unforeseen congestion, exceptional severe weather conditions, compliance with request of the Police etc. but we will use reasonable endeavours to minimise any disruption to your journey. 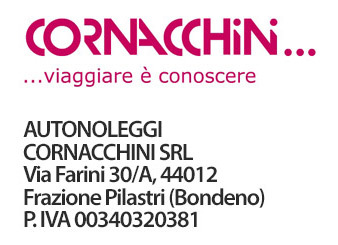 Should the A13 motorway and the Bologna ring road be blocked, the Company's drivers - upon permission from the Company - may deviate from the advertised route. No refund is allowed unless the Company's service is cancelled without giving notice beforehand or unless the service is delayed because of circumstances under the Company's responsibility, which means in case the service is cancelled or interrupted because of a vehicle breakdown and in case there is no other service available at the same scheduled time or within 30 minutes from the scheduled time. In this case, the provable damage which the passenger may suffer or incur as a result of the Company's failure to carry him/her, or delay in carrying him/her will be recognised and a refund up to the amount corresponding to 2 ticket fares paid by the passenger will be granted. In the event that the passenger is obliged to use a taxi, the taxi fare will be refunded but the refund will be limited to an amount corresponding to 4 ticket fares paid by the passenger. Any passenger that do not hold a valid ticket will be charged a penalty charge amounting to a minimum of 100 Euros. 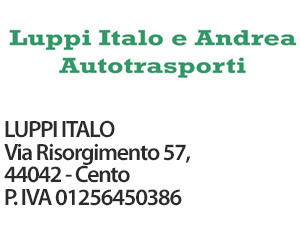 We reserve the right to prosecute any passenger travelling without a valid ticket who does not pay the 100 Euros. We will not allow passengers to board a service if they do not have a valid ticket or fail to purchase one from the driver. If passengers fail to comply with any of the behaviour rules in Clause "Passenger Behaviour and Responsibilities", or we have reason to believe they may continue any conduct in breach of those behaviour rules, we shall be entitled to restrain them, remove them from the Shuttle, refuse them further carriage, cancel their ticket without refund, and take any other measures as we consider necessary to prevent continuation of such conduct. The objects found onboard a Shuttle will be held at the Company's premises which are open and available for lost items' collection Monday to Friday (except Bank Holidays and National Festivals), 9:00-12:00 and 14:30-18:00. The Company welcomes all comments and complaints about its performance and is glad to identify areas for improvement. Any controversy arising from the application of all the above mentioned terms and conditions shall be governed in all respects by the Italian Law and shall be submitted to the exclusive jurisdiction of Ferrara's court. - business contacts, notices of promotions and services.